We love this cartoon from this week’s edition of The Economist, which comes from a lengthy article about the forthcoming anti-corruption summit in London. 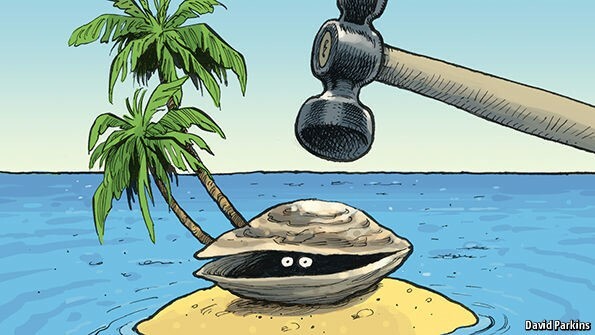 As the opening paragraph makes clear, TJN has been pushing for many, many years for world leaders to crack down on secretive offshore shell companies, and we’re waiting to see whether Prime Minister David Cameron and his fellow leaders from around the world will finally yield to demands to have true ownership information available on publicly accessible registries. “JOHN CHRISTENSEN runs the Tax Justice Network, a group that campaigns against tax evasion and corruption. A decade ago, its message fell on deaf ears. No longer. After the Panama papers leak last month, Mr Christensen says international media were camped at his door for days, seeking his views on how to stop dodgy dealings. Read the full article here. And read the new Corruption edition of our flagship newsletter, Tax Justice Focus, here.